Farming and a desire to learn and teach new skills have found their nexus at Dutch Creek Winery near Athens, Ohio. It was here on the grounds of their Wild Pear Farm that Paul and Cindy Freedman developed their love of farming, bee keeping and ultimately winemaking. Following other careers, the Freedmans poured considerable energy into their farm. In addition to a variety of other newly discovered skills, in 2008 the couple began keeping bees. This pursuit had a direct causal effect on Paul’s experiments with mead (or honey wine). It started as more of a hobby involving a series of trial runs, but it proved to be a slippery slope. With the encouragement of friends the couple started selling mead commercially in 2015. Mead, of course, is an ancient drink. In parts of Europe that did not support grape production, honey was fermented to make a sort of wine. Over the last 20 years or so, mead has steadily gained popularity in the United States and meaderies have appeared throughout the country. One misconception, and one I shared until recently, is that mead is a sweet beverage. Of course, that is crazy. It is the sugar, after all, that is turned to alcohol during the fermentation process just as it is with other wines. Depending on how long that process is allowed to proceed, meads can range from very sweet to bone dry. They are also typically flavored and there is no limit to the ingredients that can be used render a variety of tastes. It is a versatile beverage and one worth exploring. In addition to meads, Dutch Creek also offers a number of fruit wines. Honey, peaches, cherries, apples and blueberries are used to make between 200 and 300 cases of wine annually. As of this writing, Dutch Creek does not have a tasting room, but one is under construction and it is scheduled to open in 2018. In the meantime, the winery distributes to a variety of retail outlets in Ohio and West Virginia. The space that is now under construction on Wild Pear Farm will eventually allow Dutch Creek Winery to increase production, host visitors and provide room for educational programs. The desire is to develop a unique experience that includes tastings, maple syrup production, cheese making, mushroom hunting and more. It is part of the Freedmans’ interest in making a positive investment in their community. I suggest that we keep an eye on the activities at Dutch Creek Winery and Wild Pear Farm. The winemaking alone is enough to peak my interest, but the other activities combined with make this a unique venue and one worth investigating further. So after they open their doors, make an effort to visit. When you do please let me know what you think. Georgetown Vineyards is a small boutique winery located near the town of Cambridge in Southeast Ohio’s Appalachian Wine Region. The winery takes its name from the small municipality of Georgetown that was once located in the area. Owner/winemaker John Nicolazakes is a self-taught producer who began planting grapes in 1998. He currently has four acres under vine with no plans to plant more. Estate fruit includes Concord, Fredonia and Niagara. Nicolazakes sources roughly 90% of his fruit from other growers in Ohio, New York and on the west coast. In addition to grape, Georgetown produces wine from apple, cranberry, blackberry, raspberry and rhubarb. The Hocking Hills in Southeastern Ohio is a section of the Allegheny Plateau known for its cliffs, waterfalls and gorges. The Wayne National Forest extends through the region’s steep hills. More than a half dozen state parks also help draw visitors from throughout the country. There are also a handful of wineries that benefit from that traffic. One of these is Hocking Hills Winery about 20 minutes northwest of Athens. The Davidson family began planting grapes in 2008 and today have a little more than five acres under vine. Cold-heart grapes like Vidal Blanc, Frontenac, La Crescent and Traminette are supplemented with vinifera sourced from other parts of the country. The combined fruit accounts for between 1900 and 2400 cases of annual production. CEO and winemaker Blaine Davidson pointed out that more vines will eventually be planted. Norton and Petite Pearl are among the grapes that will be planted. This additional fruit will still be supplemented with sourced grapes and the long-term goal is to boost production to around 10,000 cases annually. I tasted several of the wines made from the Hocking Hills vineyards. The Traminette and Vidal Blanc were both well crafted, balanced and extremely good wines. The Trillium blend, on the other hand, was just off the charts. I am bewildered that it only won bronze at the Finger Lakes International. This blend of Vidal and Traminette is done in a dry style. Like the other whites, it was balanced and had a rich fruit component. The bright acidity and muted floral notes make it a very food-friendly wine or one that can simply be enjoyed on its own. The tasting room at Hocking Hills opened in 2015. Even on a weekday in the late autumn, there was a decent crowd rotating through the bar or enjoying the fire in the corner of the room. I found the staff to be enthusiastic, knowledgeable and customer oriented. It was an experience designed to encourage customer loyalty and this must certainly pay off. The winery has a very loyal group of local clientele. 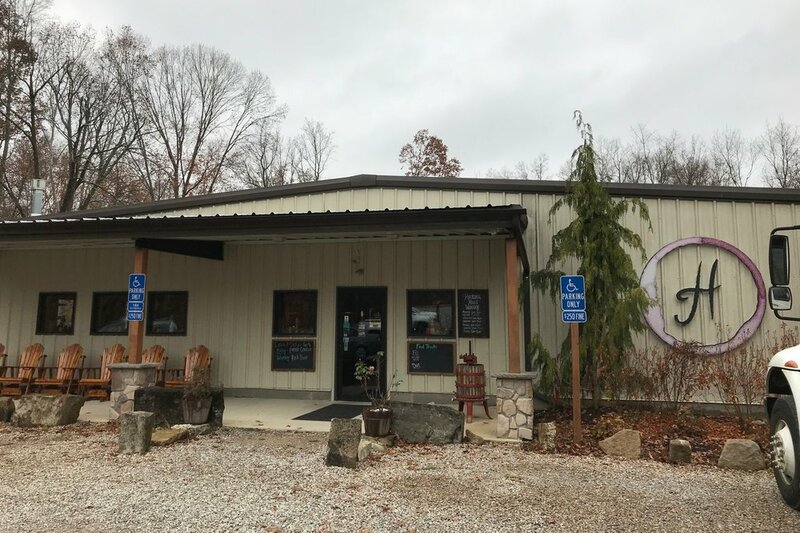 Located just off Route 33, the main highway between Columbus and Athens, Hocking Hills Winery is conveniently located to capitalize on tourist traffic or people just passing through. The experience and quality of wine are two big reasons to visit. This is a winery that we should support. If you are anywhere near this beautiful part of the country, make a point to drop in. After you do, please let me know what you think. I was headed to Ohio for Thanksgiving and my route took me within a half mile of Merry Family Winery near the town of Bidwell in the southeastern corner of the state. I had done some research in advance. One of my criteria is that the winery must grow at least some of its own grapes or source from local growers. I am not interested in tasting west-coast wines in an eastern winery. Merry Family uses estate, local and out of state grapes (as well of other types of fruit). The tasting room is inside what appears to be an old grist mill. Although the actual history of the building is not known to me. The long covered porch provides ample seating outside and as you pass through the front door, it is hard not to be surprised by the size of the tasting room itself. There is a very long tasting bar along the back wall, a long row of wine racks filled with Merry Family wines and plenty of indoor seating. I arrived right around lunch time on a Tuesday and noted that a number of visitors were purchasing quantities of wine. They were largely local and repeat customers. That is always a good sign. So I bellied up to the bar and introduced myself. I will say that I called in advance. I do not always do that, but if I am traveling that far, I find it best to give some warning. The winery was closed when I called and the owners did not get my message, which is fine. I will say that they seemed a little put out with me and never quite warmed up to the idea of me asking questions. Merry Family also produces a line of craft beers. Apparently someone wrote a bad review of the beer, so the owners are weary of bloggers. From my perspective that is unfortunate, because I predicate my review as much on customer service and experience as I do on quality of the wine. Merry Family has eight acres under vine and they augment that with in-state and out-of-state fruit to produce around 4000 cases of wine annually. They started planting in 2000, produced the first vintage in 2006 and opened the tasting room in 2009. The wines can be found in about 200 retail outlets in Ohio and West Virginia. There were a total of 28 wines on the tasting sheet and I do not think all of their wines were represented. There is a limit of six samples per customer and you simply select from the list. It is a little like a sushi menu. I limited my selections to wine produced from local fruit. The six wines poured in six glasses. The tasting is largely self directed. I tasted a Frontenac from the first vintage produced from that varietal. I think it showed promise. I also tried a couple of well-crafted red blends, but the real story is the Riesling. I tried both an off-dry and sweeter late harvest wine. The off-dry was my favorite of the tasting with its melon and ripe pear notes, I thought it was an excellent wine. If you are in Southeastern Ohio, Merry Family is only a minute or so from Route 35. If you are interested exploring the wineries of Ohio, this should be one of your stops. After you stop in, please let me know what you think. I am told that on a clear day there is a 14-mile view from the back deck at Pleasant Hill Vineyards near Athens, Ohio. A series of storms were rolling through on the day of my visit, so I cannot attest to the view, but I can say that the 82-acre property sits amid a beautiful expanse of rolling hills. It is little wonder that the spot is so popular and draws visitors from as far away as Columbus. Pleasant Hill only opened in 2014. That same year they planted a couple acres of vines on the 82-acre property with plans to gradually increase the vineyard blocks to about 4 acres. They are currently sourcing fruit from Northern Ohio, Oregon an New York until the rows of Seyval Blanc, Marechal Foch, De Chaunac and Noiret bear fruit. It is a family business. Ross Corder makes the wine, but other family members contribute to make the tasting room a popular destination. Full meals are prepared in the Pleasant Hill kitchen and the venue is known for its food. There is steak on Friday and Italian night on Wednesday. In addition, they host a variety of corporate events and it is easy to see why the property is such a popular wedding destination. 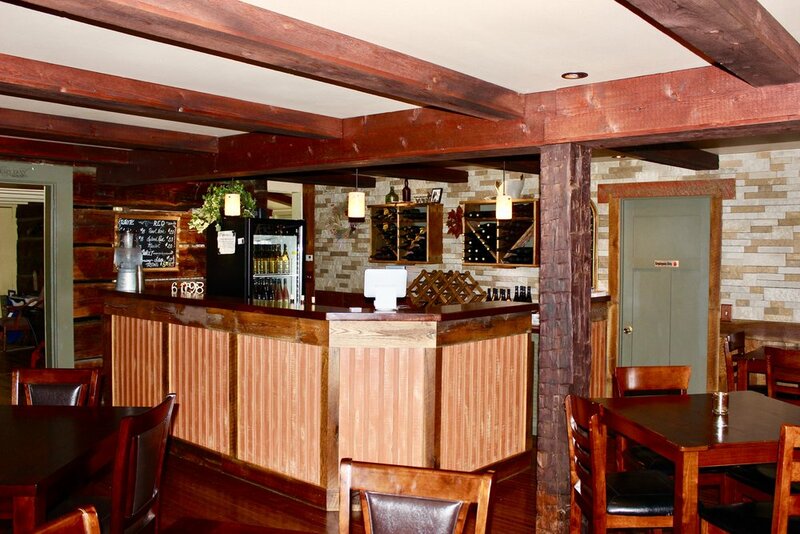 The tasting room began as log cabin built in 1832 by a veteran of the War of 1812. Ross’ son Nick left a career in carpentry to help with the business and set about adding to the structure. He built the back deck and upgraded the other amenities to make the tasting room into a truly welcoming space. Ross learned the winemaking craft by working for other winemakers. He and his wife Sandy learned most aspects of the business while apprenticing at Rainbow Hills Winery in Coshocton, Ohio. Ross honed his skills to the point that he is now producing over 800 cases of Pleasant Hill wine annually. The Pleasant Hill wines are solid. I tasted through a few with Ross and I will say that the whites are balanced and the reds display complexity. The lineup is largely food-friendly, which supports the winery’s culinary program. Two standouts were a bone-dry Seyval Blanc and a perfectly balanced Chardonnay. The signature Leland Red, however, was the showstopper. This blend of Cabernet Sauvignon, Merlot and Syrah is big and complex with rich fruit and a very long finish. Despite the fact that this is a relatively new winery, Pleasant Hill Vineyards is trending in the right direction. The quality of the wine combined with the tasting room experience and beauty of the venue all combine to make this a must-visit winery. We should definitely rally to support them. So after you stop in, please let me know what you think. Lee and Joy Wyse were preparing to leave Australia at the end of a five-year stay. After saying goodbye to friends they knew they may never see again, they noticed that a rainbow ended on the road in front of them. This image stuck with them. Years later, when they decided to open a winery, it became the basis for the name. In 1988 the couple opened Rainbow Hills Vineyards on old farm that had been long abandon before being reclaimed by Lee and Joy. Five years earlier they planted the a five-acre vineyard. The grapes were primarily American varietals. Lee was the original winemaker. Although primarily self-taught, he also consulted with other talented winemakers. Other projects on the property included conversion of a log cabin, built in 1831, into a bed and breakfast. The Inn at Rainbow Hills has four private rooms. It is meant as a retreat for those who want to escape to a quite, rural location and just relax or explore nature. Following the sudden death of her husband in 2013, Joy took charge of all the day-to-day operations. It was never intended to be her sole project, but she has kept things running. We will have to wait and see what the future holds for Rainbow hills. In the meantime, Joy brought in Robert A. Smith as the winemaker. The winery produces roughly 1250 cases and 13 different wines annually. All of the wine is made from Ohio fruit. Estate grapes are supplemented with from growers primarily in the surrounding counties. Rainbow Hills Vineyards is located just minutes from Interstate 77 and less than 90 minutes east of Columbus. 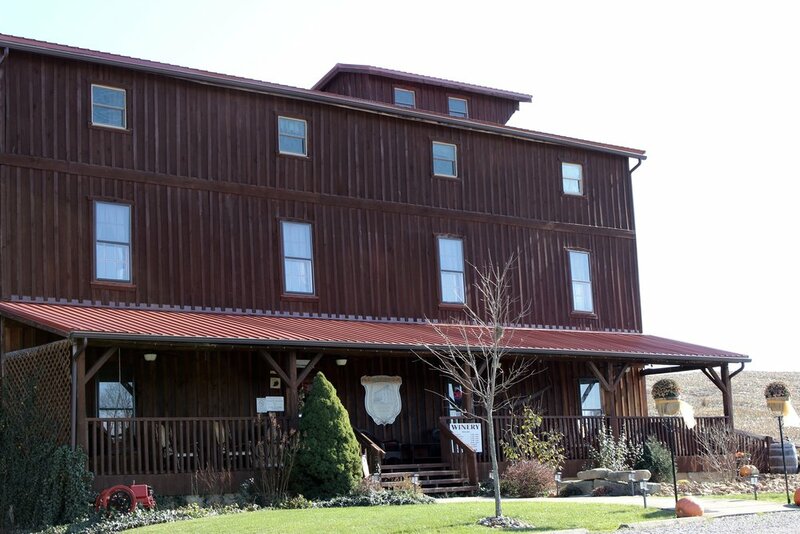 It is also cluster with several other wineries and it is in the midst of Ohio's Amish country. It is ideal as a destination for an overnight or longer and can be a jumping-off point for exploring the other nearby wineries. It is certainly worthy of our support. So after you visit, please let me know your thoughts. There are now well over 250 wineries in the state of Ohio. The southeast corner of the state, known as the Appalachian Wine Region, has the least viticulture of Ohio’s five regions. Having said that, there are some exceptional winemaking efforts taking place. Shade Winery is one of the producers demonstrating the quality that is possible in the Appalachian foothills. Owner and winemaker Neal Dix completed he licensing process and the winery was bonded in 2004. He then opened a beautiful little tasting room in 2010. Dix also planted just over two acres of vines on the estate and things were trending positive until the polar vortex of 2013. If you spend any time exploring wineries in Ohio, you will almost certainly hear stories about the polar vortex. Vineyards throughout the state suffered and Shade was one of them. So the years since 2013 have been dedicated to rebuilding and finding fruit with which to make wine. The Shade vineyards have since replanted and are once again producing fruit. Dix has planted Chardonnay, Vidal Blanc and all of the Bordeaux varietals accept Malbec. In years immediately following the vortex, however, it was necessary to source from Ohio growers when possible, but most of the fruit came from out of state. I tasted a handful of Shade wines during my recent visit. Dix first poured a trio of whites. A dry and an off-dry Vidal Blanc were produced with estate fruit. Both were perfectly balanced, food-friendly wines that displayed the right combination of fruit and acidity. I also taste an excellent Traminette made with Ohio fruit. Dix then poured a pair of reds made from sourced grapes. A Merlot and a Syrah/Cabernet Sauvignon blend demonstrated the winemaker’s skills in crafting complex, nuanced reds. It will be exciting to see what Dix can do with the estate grapes that are nearly ready to harvest. I predict that we will see some great wines bearing the Shade Winery label. It is necessary to point out that this venue offers more than great wine. Tucked into the hills of Southwestern Ohio, Shade feels like wine country. Looking up from the well-appointed tasting room, the rows of vines are arranged in two blocks and forested acreage frames the remainder of the property. It is a destination worthy of a picnic, wedding or just whiling away a few hours with friends. There is a small cluster of other wineries near Shade and it is just a short drive from Columbus. 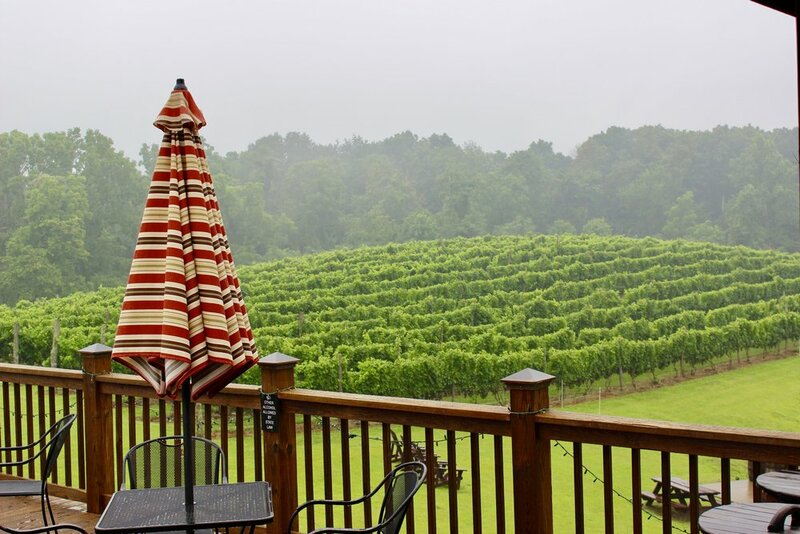 I suggest that if you are interested in exploring fine-wine production in the Appalachian Region, this is a winery that should be on your short list and Shade Winery will provide a glimpse of what is possible in that part of the state. Make the effort. Stop in and after you do, please let me know what you think. Can a winery open shop and sell wine in a dry town? It appears that it can be done in Ohio. Back in 2000 or 2001, Joel Whitaker was given a home winemaking kit. He caught the bug and continued to hone his skills for several years until he began to consider commercial winemaking as a retirement project. In 2009, Joel and his wife Barbara located a space in the town of Belpre, Ohio and opened a winery and tearoom. This is a pretty common trajectory for winemakers, but with a slight twist. Belpre is a dry town. It was okay to make wine, but selling it was another issue. So Barbara began doing research and making calls. What she discovered was an Ohio law that allows manufacturers to sell their products out of their production facility. This regulation allowed the Unicorn Wine Guild to open a tasting room and sell bottles direct to consumer. By any measure, Unicorn is a small winery. The Whitakers produce less than 500 cases annually. Barbara expanded the venture to include tea. They also serve food and teach winemaking classes. It appears to be an eclectic, but vibrant business. The Unicorn wines are produced exclusively from sourced juice. This allows Joel to produce many small batches of wine. Indeed, one might be almost overwhelmed by the number of options on the wine list. I counted 52 different wines made from grapes and a host of other fruits. The options run from dry-style to sweet dessert wines. There is genuinely something for every palate. I tasted through a few of the options with Joel. He is, as you might expect, very enthusiastic about his wine. What I discovered was a range of well-crafted offerings. So while Unicorn may not be a traditional winery using estate or locally sourced fruit, the Whitakers are making good wine. I will argue that Unicorn Wine Guild serves an important role in this small Ohio River town. They are one of just a handful of local producers who are helping educate the wine-drinking public. There is certainly a place for Unicorn and we should make an effort to support them. Stop in and see what they are up to. After you do, let me know what you think. Mar. 25-Dec. 28 Fri-Sat 1 to 8 and by appt.